Here it is! The post many of you have been waiting for. I’ve been meaning to write this for months, and finally, on December 18, I sat down and spent the day writing it… Lucy must have known it was checked off my list, because my water broke that night! Enjoy, and please feel free to reach out to me if you have more questions about my experience. Five months ago, I shared the exciting news that Anthony and I were pregnant, and described the emotional, spiritual, and just a glimpse of the physical journey it took us to get there. In that post, I promised to write a more detailed post dedicated to our physical journey to fertility. Here I am, in my ninth month of pregnancy, just 10 days away from our due date, finally writing about our journey toward healing and the book that led us there—WomanCode by Alisa Vitti. First of all, credit for how I even heard about this book goes out to the Holy Spirit—or the “sneaky Holy Spirit” as Anthony calls Him. It was the last day of February, and I found out I wasn’t pregnant, once again. We had been struggling to conceive for almost a year, and we were heartbroken and feeling a bit hopeless. Looking for a glimmer of hope, I randomly reached out to a friend (who also was struggling to conceive) who had mentioned a while ago to let her know if I needed a recommendation for a fertility doctor. I didn’t, but I was desperate. In her kind, extremely helpful response, she didn’t actually mention a doctor (which I didn’t actually need at that point). She pointed to the book WomanCode, by Alisa Vitti, and described some of the concepts from the book. (I didn’t know it at the time, but this friend was very newly pregnant, thanks to WomanCode!). I emphasize all of this because, in hindsight, it made no logical sense to reach out to my friend. Yes, I was desperate, but I didn’t need another fertility doctor (which is what I thought she would provide). We already had two separate Catholic OB-Gyn doctors—one in Chicago who is a NaPro technologist, and one who worked with us remotely via FEMM health—whom we felt very comfortable with and who were helping us take pro-life (i.e. no IVF) approaches to try to conceive. Additionally, I knew this friend had also been trying to conceive, but I had no idea she was already pregnant—so I didn’t know that anything she recommended would actually work. She also had mentioned this to me six months ago—why did I randomly think about it and decide to take her up on her offer now ? Finally, I didn’t actually know this friend that well! We met through Instagram and had only hung out a few times, so reaching out to her like this was all the more unusual. When I thought about all of this much later, I realized it was, without a doubt, the Holy Spirit that had nudged me to text my friend, despite all these illogical reasons to do so. So, like every good thing in this world, our healing came through God and His wondrous work. In fact, for all those who say that faith and science oppose each other, this is an example of how God used science—the human body, His very creation—to heal me. He led me to this beautiful book that would provide me with the knowledge and power to heal my infertility by eating and living the way He intended our bodies to. So, what is this WomanCode? I truly wish every woman would read this amazing book. Whether you are trying to get pregnant or not, whether you have a reproductive health condition (such as endometriosis or PCOS) or not, whether you have terrible PMS symptoms or not, Vitti’s WomanCode protocol is for you (and no, this is not sponsored). (I didn't have any diagnosable condition or known reason why I wasn't getting pregnant, and Vitti’s book is geared toward those who do and don't know why they are having reproductive issues.) Yes, the book outlines a natural protocol that can help with all of these issues, but this way of living also can help with less serious issues—like acne and insomnia—to more serious issues like chronic anxiety or depression. Further, this way of living can help prevent serious chronic diseases like cancer, heart disease, and more. Plus, it's free, it's good for your overall, long-term health, and it's non-invasive. While I can’t describe Vitti’s whole protocol in this post (that’s why it’s a book) I will share the main pieces of the protocol that I implemented. There are so many tenets and tidbits of Vitti’s protocol, it’s easy to get overwhelmed by all the changes you could (or “should”) be making. Vitti stresses the importance of implementing these tenets one at time. While I was eager to see results (i.e. a baby!) Anthony reminded me that these changes are meant to be lifelong; doing something consistently over time is better than getting overwhelmed from trying to implement all of it at once (and then giving up). Vitti recommends eating breakfast within 90 minutes of waking up and then eating a meal or snack every 2.5 to 3.5 hours throughout the day. She specifies what types of foods (fats, carbs, protein) to focus on at which meals. For instance, breakfast should contain the most carbs (no more than 30 grams) we eat throughout the day because we have all day to burn them off. Lunch should be our biggest meal (not dinner!) and contain one complex carbohydrate (i.e. beans or vegetables like sweet potatoes) and a healthy fat (i.e. avocados or EVOO). The mid-afternoon snack should be nutrient rich to keep you full until dinner. Vitti recommends dinner should be mostly protein and veggies and largely avoid other carbs. She also has a three-day cleanse described in the book that I did once I got the hang of these lifestyle changes. I used a note in my phone (screenshot below) as a shorthand version of Vitti’s diet recommendations. Some people I know don’t like anything where they have to “track” something—you certainly don’t have to. Being type A, I used this note to remind me what kind of foods to eat at which meals, the time I had eaten, and roughly how many grams of fiber I ate at each meal (see next point). The water droplet emojis showed me how many cups of water I had drank. If this stresses you out, do not use it! I simply share it because I found it helpful—it is certainly not necessary, though. Long story short, fiber acts as a sponge for excess estrogen and other toxins (which throw off our hormonal balance) to flush them out of your system—Vitti explains this fully in the book. We need 25 to 35g of fiber per day, but most people only get 9 to 10g of fiber per day! I reached the recommended 35g of fiber per day without fiber supplements by starting my day with a fiber packed smoothie: frozen fruits (raspberries have the highest fiber content per serving) and frozen peas (also very fibrous) or frozen kale, coconut water, natural peanut butter for taste, chia seeds (lots of fiber per serving), ground flaxseed, and maca (not matcha) powder. It tastes fine, and gets you a lot of fiber to start the day! Just make sure you're drinking lots of water, too (I drank two cups of water as soon as I woke up). For snacks, I would eat lots of veggies (sweet potatoes, broccoli, brussel sprouts), beans, and nuts. I also ate “avocado toast” on these extremely fibrous “crackers” called "GG Scandinavian Bran Crispbread". Basically, they are large “crackers” that taste like nothing filled with tons of fiber per serving (sounds appetizing, I know). Other than avocados and olive oil, sometimes I put natural peanut or almond butter on them, or even mozzarella cheese and a couple pepperoni slices and baked them in the oven for a few minutes. For dinner, I usually ate a smaller version of what I’d eat for lunch—protein, whole grains, and lots of veggies. See my Fiber Pinterest page, or look up Tanya Zuckerbrot’s Instagram or her “F-Factor recipes” for more ideas on how to stock up on fiber. This relates to step #1, but Vitti highly recommends cutting out refined sugar, i.e. carbs that are not whole grains (so white breads, white rice, etc.) and of course, sweets. I thought this would be so hard for me because I love sweets, but I was so motivated to have a baby that I literally cut out anything that had added sugar! I admit, I’m not this strict anymore, but I really do try to limit my refined sugar, as it affects our blood sugar (step #1) and therefore our hormones. This one can seem a bit daunting at first. Most mainstream brands of products we put on our skin, hair, or use to clean any part of our home can actually disrupt our hormone balance (which deems them “toxic”). This includes almost any beauty product you buy at Sephora or a drug store, and most household products. The good news is that every product has a “clean” or nontoxic alternative, but making the switch requires intentionality. I used the apps Think Dirty and EWG’s Healthy Living on my phone to look up products I owned to see if they were toxic or not. If so, when I ran out of a “toxic” product I would buy a new, clean alternative. In short, “clean” means it doesn't have a lot of common ingredients that can be hormone disruptors (parabens, ethanolamines, BHA & BHT, sodium lauryl sulfate, phthalates, and polyethylene glycol (PEG) compounds are the heavy hitters). For household products, Seventh Generation is a reliable brand, but I cannot recommend Branch Basics enough (you can use this link to get $10 off)! For cosmetics, the stores Follain and Credo offer only clean, nontoxic options, as well as the brands Honest Beauty and BeautyCounter, and almost any beauty or household products you buy at Whole Foods. 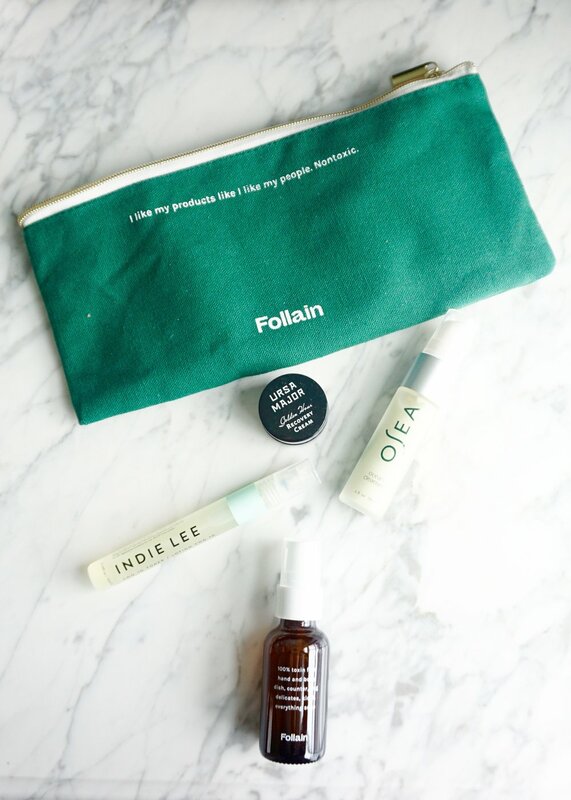 Since doing a massive overhaul of all these products can be expensive and overwhelming, I’ve partnered with Follain, who is offering 50% off and free shipping their “Clean Essentials Kit” (seen here) with code ref_uxwpxx (which means you get it for $11!). This is a starter kit which features a skin cleanser, toner, and cream, plus an all-purpose soap. So many friends have asked me where to start when replacing beauty/skin products, and this is my recommendation. An affordable option, with four products I love, but small enough sizes that if you don’t like them, you’re not committed to using them for the next few months. Follain is also offering 15% off your entire purchase with code ref15_9dpiwa so if there are other products outside this starter kit that you want to try, you still don’t have to break the bank making the switch. Another vital lifestyle change Vitti recommends is to slow down in life. I had a busy grad school schedule, and wasn't getting enough sleep or rest. Like many of us, I was always on the go, cramming studying/activities/work/social events into just about every free second I had. I barely took the time to chew my food—which is literally a problem that Vitti cautions against! In addition to teaching readers to eat more slowly (take 10-30 chews per bite—what! ), Vitti has a whole chapter on emotional boundaries, which I had to learn to implement (and since, have written a Verily magazine article about!). For me, this looked like learning to say no to friends or activities, literally slowing down my life, and taking things out of my life that caused me stress or anxiety (as much as possible—I still had capstone projects and papers due). Additionally, I started getting to bed by 10pm and getting at least eight hours of sleep. To help with that, I set my phone to go on “Do Not Disturb” from 10pm to 7am every day, so I wouldn’t even see texts or calls that came in during that time (this setting even accounts for emergencies). This helped me sleep by getting the light of my phone out of my face, as well as not worrying about responding to texts, etc. during that time. Vitti explains that this step is really important for normalizing our adrenal glands, which are often burnt out by staying up late, not getting enough sleep, and going, going, going in general. This, in turn, severely affects our hormones. The hormone panel I had done actually confirmed that I did indeed have “adrenal fatigue,” as Vitti calls it, so slowing down—both chewing my food and in life—was a crucial step for me on my journey to fertility. Another factor that contributes to adrenal fatigue, according to Vitti, is caffeine consumption. Vitti explains the science behind it much better than I can, but it all made perfect sense to me. So I switched my daily cup(s) of coffee to decaf coffee (she actually says no coffee at all, but I love it too much). Some days, though, I completely replaced my morning coffee to a cup of hot water with fresh lemon. It is so delicious (and good for your hormonal health) and something I came to love and crave! I’ll stress again that making any of these changes takes effort, and seeing results takes time. Like Vitti, I recommend implementing only one of these tips at a time. Once it becomes engrained, then try to add in another step. Taking on too much at once only sets us up for failure—we become overwhelmed, and then quit. Take on only how much is manageable. And remember, small changes kept over the long haul are better than taking on everything at once, becoming overwhelmed, then quitting. I also want to emphasize that while I believe wholeheartedly in this protocol, every body is different; your hormone levels and exact reproductive issues are different than mine were. I can’t guarantee that if you do exactly what I did you will have the exact same success or it will happen in the same amount of time. Instead, I recommend making any changes with the idea that you will maintain them throughout your life, rather than thinking of them like medication—a means to an end. I certainly didn’t expect to be pregnant in less than two months from starting the WomanCode protocol—I expected to be in it for the long haul. Try to be patient with your body and these changes. Please reach out to me if you have any other questions. I continue to pray for all those suffering from infertility or miscarriage; you will always have a special place in my heart and in my prayers.